Embark onboard the “Olphi Nui” for a fish trip around Tahiti to catch tuna, marlins, bonitos and other big fish. Trolling, stand-up lift-up, line fishing… every technique will be good to catch big fish with the professional equipment at disposal onboard. The tour begins with an early departure (07h30) from the marina Taina, you will be welcomed with coffee before a briefing on the program of the morning and leave to the fishing area. ONO’U International Street Art Festival became a not to be missed urban culture event since its creation in 2014. More than 30 murals now embellish the city’s walls bringing modernity to Papeete where a few grey walls earned a second life. 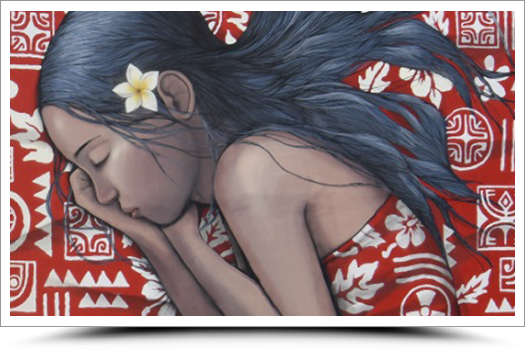 You will discover no less than 25 murals during this guided walking tour in the streets of the city and in Ono’u Museum, the story of their creation and the artists who painted them. The walking tour is followed by a guided visit of the Street Art museum featuring works especially created for this artistic place. Operates everyday; 2 Adults min – 6 Persons max, (Adults or Children). Free for children under 12 yrs accompanied with an adult. 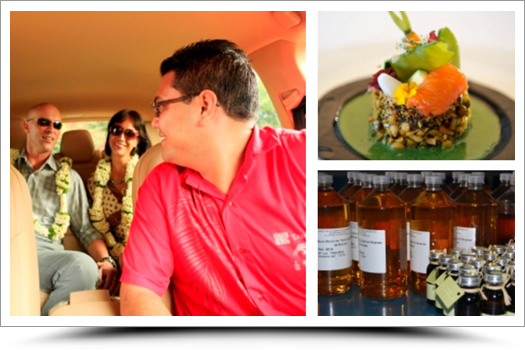 Take a private tour of Tahiti in a deluxe car, with an expert guide to introduce you to the island’s secret ingredients. For starters, tell your guide what you enjoy doing and what you would like to see on your tour and he will create a customised trip filled with culture, history, a splash of nature, botany, a hint of geography, music and anything else that takes your fancy. We recommend sampling some Polynesian treasures for dessert: pearl, monoi oil, vanilla and local crafts. Lunch (3 courses) at Coco’s restaurant, located on the seafront facing dolphins and Moorea. Enjoy the alliance between products from Fenua and top quality produce from far-flung countries. Calling all adrenalin junkies: this is for you! 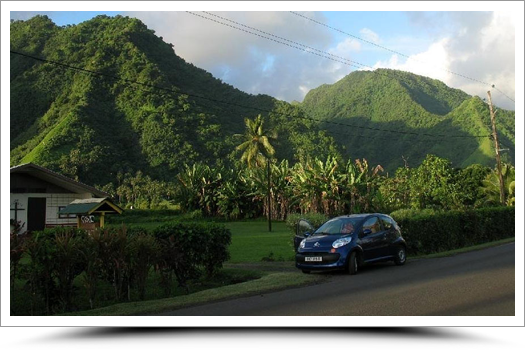 First up, take a 2 hour trip in a cruiser (buggy style vehicle) around the mountain and explore Tahiti’s natural beauty from lush flora and giant ferns to deafening waterfalls. Next, take an hour-long Jet Ski trip out on the lagoon and speed off along the route of your choice (depending on weather conditions). Explore the lush green idyllic South Pacific island of Moorea. Just a short 30 minute ferry ride from Papeete awaits a tropical paradise yours to discover. A variety of day tours are available where you can explore the island of Moorea by either land, lagoon or both. Please inquire for more details and specifics on tour availability. Take a tour on a trip around the island and discover some of the treasures of Tahiti. Start with the West Coast and the famous Marae Arahurahu, religious site dedicated to the ancient gods where important ceremonies used to take place. 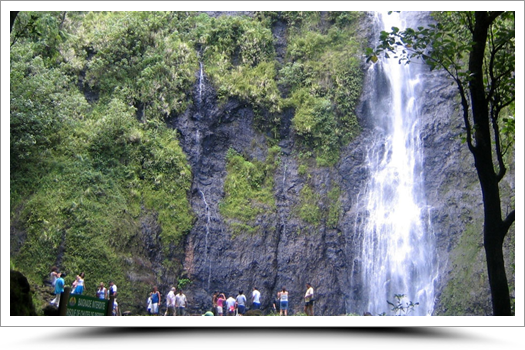 Then continue with the visit of the beautiful gardens and waterfall of Vaipahi set in a lush tropical environment. Do not miss the East Coast and its Blow Hole, natural site recently rehabilitated for visitors or the famous Venus Pointe, who saw Captain James Cook landed. Then wrap up your island tour by a breathtaking panoramic view at the Taharaa View Point. 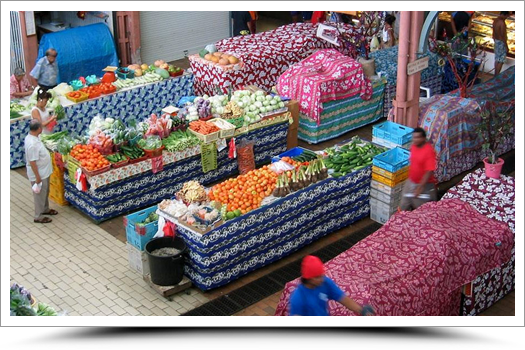 The tour begins with a visit on foot in our traditional market where the Tahitians sell fish, fruit and crafts etc… Then you will head to the Cathedral of Papeete and the Vaima Center to enjoy its numerous shops. Finally, hop on a vehicle for a discovery tour of the Polynesian Intitutions, with at the end of the trip a visit of Pearl Museum. Have a day out exploring the capital city in the morning and spending the afternoon in Tahiti. 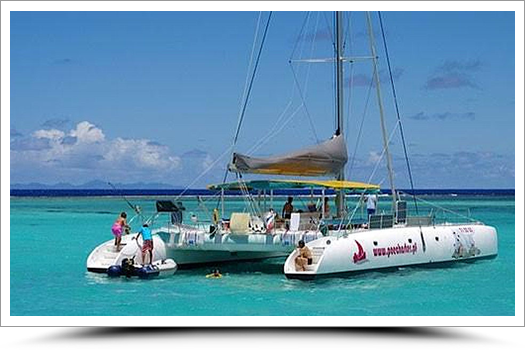 The tour is a combination of the “Papeete Visit” and “Tahiti Island Tour” with a lunch break in Papeete (meal to be paid on spot). 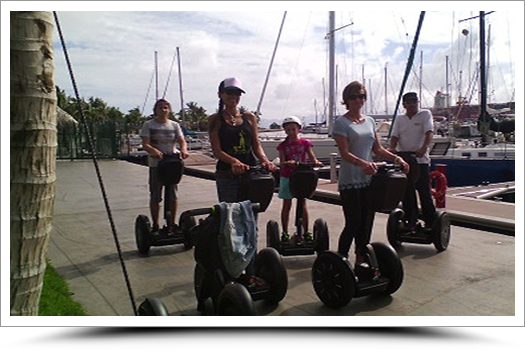 After half an hour of good practice on your segway, your tour guide will be leading you along the Paofai Parc, as well as the newly renovated marina, along with a stroll down town, right in the heart of Papeete City Center. Slalom between pedestrians, take a look at the city streets from above. 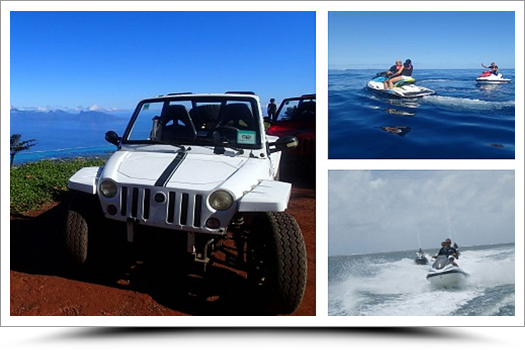 A fun and easy ride awaits you guided by an expert of the Tahitian History for a memorable evasion! Rent a car and hit the road to explore Tahiti. 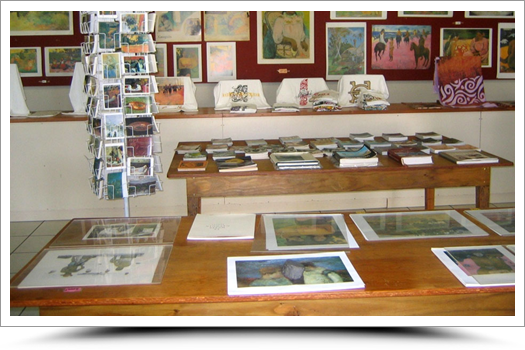 Drive around this magical South Pacific paradise stopping along the way to take in the views, capture memories on your camera, shop the boutiques for souvenirs and visit some the local attractions. I would recommend renting a car for at least one full day but many take them for their full stay. Available in both Automatic or Manual Transmission. Set off from the East coast towards the centre of the island and explore the Papenoo crater. Here you will find lush vegetation, giant ferns and a myriad of colourful plants. 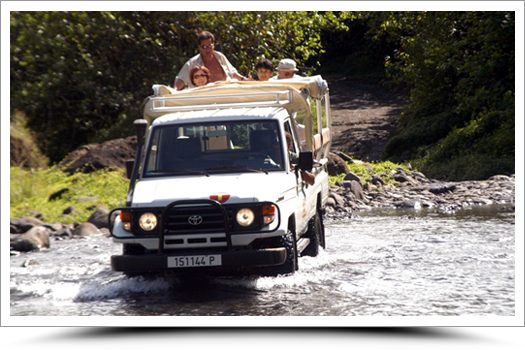 Your 4×4 will take you over rivers from where you can admire Tahiti’s waterfalls and misty mountains. 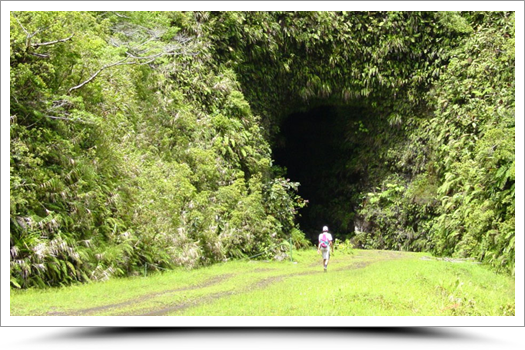 You will get to the heart of the island by exploring the main crater in the Papenoo Valley. There get ready to discover the lush vegetation of Tahiti with its giant ferns and colourful plants. 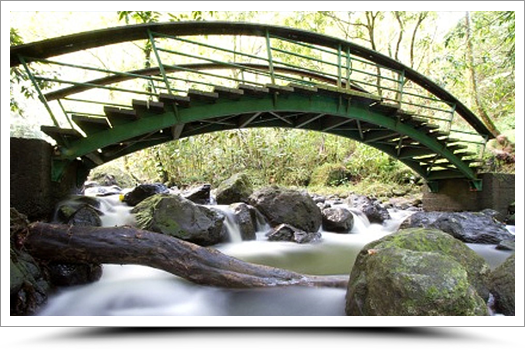 You will cross rivers, view impressive waterfalls and pure mountain streams. During the tour, time will be given for lunch (at your own expense) while looking at the marvellous panorama of the valley. Visit archaeological sites and learn more about the local flora and fauna before getting dropped off back at your hotel at the end of the day. 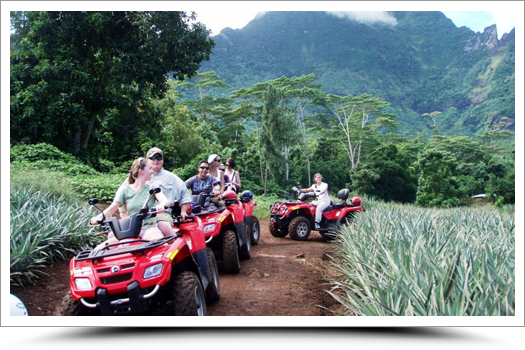 Explore Tahiti and its valleys on board your Rhino (a type of buggy that you drive and follow your guide). This is a great way to see Tahiti’s natural beauty: lush flora, giant ferns, waterfalls etc. You and your guide will make pit stops for great views of the mountains, valleys and lagoon. The Rhino is a fun and unique way to discover another side to Tahiti whether you’re driving along the road or dirt tracks. Get ready to cross rivers and discover waterfalls falling out the foggy mountains surrounding you. Be the lucky one to enjoy the beautiful points of view given during the tour of one the valleys or the lagoon. 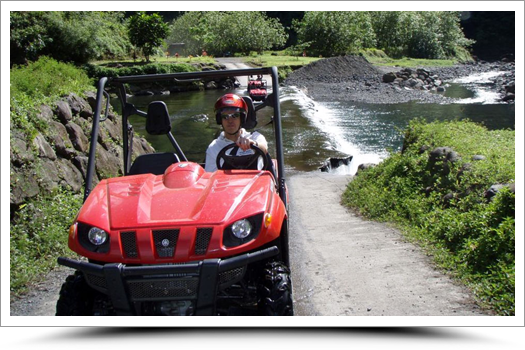 Off Road or back on the track, Rhino tour is your fun way to discover the island. Various tours are available in either 2 hours, 4 hours or full day tours. Tahiti will offer you your first introduction into the rich, tropical waters of French Polynesia. The incredible biodiversity of the dive sites showcase the rich flora and fauna, from colourfull nudibranches to Lemon sharks. 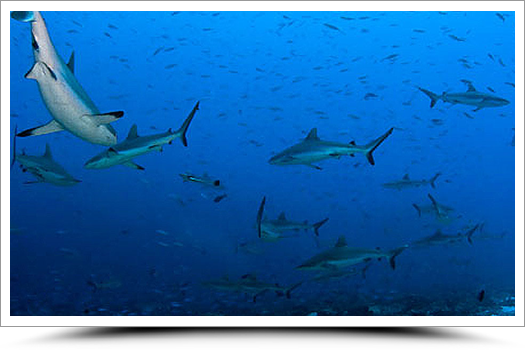 Tahiti is also the ideal island to learn scuba diving with some perfect dive sites in the lagoon like “the aquarium” or “the wrecks”. Single Dives and Multi Island Dive Packages Available. 2 Initiation Dives + 2 shell leis + 2 fruit juices + the video of your diving. An introduction to diving on our islands is all about the excitement of discovering a new world, the unique sensation of being weightless under water, and being enchanted by abundant aquatic plant and animal life in a variety of colours and shapes. 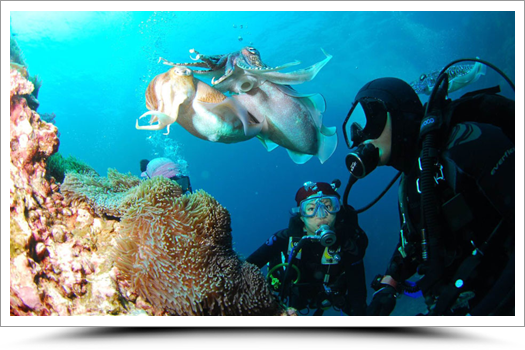 It’s also an experience to share with people who are passionate about diving. It’s accessible to all & no particular skills or knowledge are required. You just need to be in good physical condition. Our warm, abundant, calm waters and excellent visibility are sure to make for a successful introduction to diving, in complete safety. According to the island & diving site, sit at the controls of a sunken plane wreck; meet tortoises, sharks, rays and even sometimes dolphins; admire a moray eel weaving gracefully through the water, or the clown fish dancing in their strange anemones, from close up; laugh at the triggerfishes’ big lips and the parrot fishes’ beaks; look for octopuses whose chameleon-like skin blends in with the background… Polynesia is a dream location for an introduction to diving, and maybe the start of a new hobby for you… At most of our centres, you can take the necessary courses to become a certified diver (PADI/CMAS training). When you arrive at the diving centre, in the morning or afternoon depending on the centre you choose, your instructor will provide you with a diving suit, life jacket with pressure reducing valve, flippers, mask etc. The introduction is either carried out directly from the beach, or at a shallow spot in the lagoon, which you reach by boat. Before you enter the water, the instructor will explain all the safety instructions and show you a few simple signs so you can communicate under water. The introduction takes place at a maximum depth of 0 to 6 metres in French Polynesia, and lasts around 20 to 30 minutes, with a maximum of 2 beginners per instructor. The instructor will stay by your side throughout the dive. 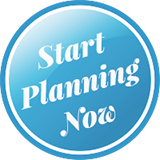 They will assist you, guide you and show you the site’s features of interest. Set off on a Polynesian style outrigger pirogue for a trip to the Aquarium. 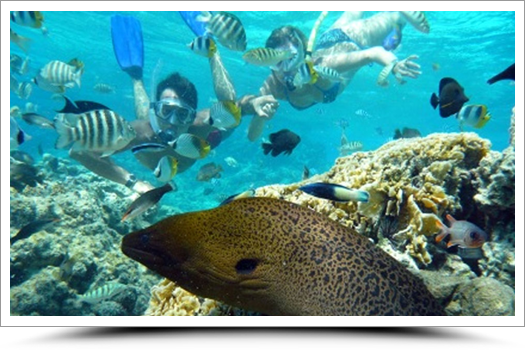 The Aquarium site is 10 minutes from the diving center and within Tahiti’s lagoon. The site is well-known by the divers for its clear waters and wealth of multi-coloured fish. Your guide will be with you throughout the trip. If you have an underwater camera, make sure your batteries are charged and there is plenty of room on your memory card. All tours listed are shared tours in small groups. Most tours are also available on a private basis as well if you prefer something more intimate and personal. Spend a couple of amazing hours with a pod of spinner dolphins. 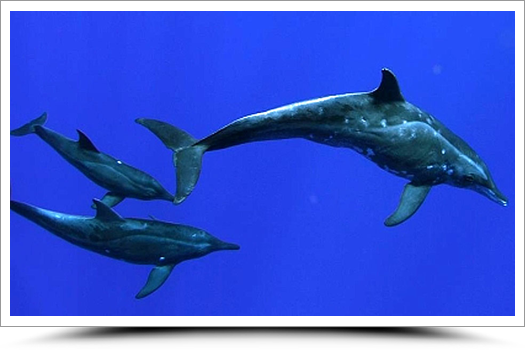 These playful dolphins will leave you spellbound with their leaps and acrobatics. Take a trip out on the lagoon up to Taapuna Pass before taking to the high seas and sailing to the fishermen’s bay where the dolphins love to play. Depending on the weather, you may also be able to get in the water and swim with them. Every year, from August to October, Polynesian waters welcome many humpback whales (Megaptera novaeangliae) coming to mate and give birth before returning to the South pole. 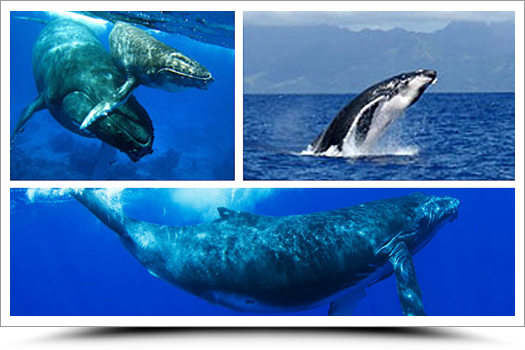 During this period, one can encounter these whales around Tahiti, solitary or with their offspring. For this season, we invite you to join our whales watching tours to observe the migration habits of this unique mammal. A day at your own pace and in complete freedom. With your rental car, you can choose your route to the peninsula and the stops you will make. East coast or west coast of Tahiti, that is the question. Enjoy the relaxed atmosphere of Snack Maui and your lunch feet in the sand. The menu gives pride of place to fish and shrimps of Teahupoo. Treat yourself with the “assiette gourmande” (Raw fish with coconut milk, raw and fried shrimps, tuna tartare, salad and rice). Haunui and Maruia, his wife, young and friendly excursionists, will be waiting for you at the marina for the boat tour (exact time of the tour confirmed at time of booking). Head to the wave of Teahupoo with the beautiful landscapes of the peninsula as panorama. 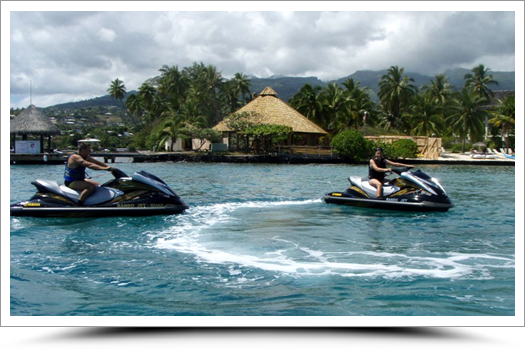 After a quick briefing from your guide, hop on your Jet Ski and follow the guide to explore the lagoon of Punaauia and Faa’a with its great view of Moorea. Depending on weather conditions and journey time, there are a range of routes you can take. For example, you may be able to go to the fisherman’s bay to see the dolphins, stop for a swim at the so-called aquarium where you can admire the tropical fish and coral gardens or you go right up to Papeete harbour. onboard. You will be cruising back to Papeete with the sound of the Ukulele and a cocktail served at sunset. 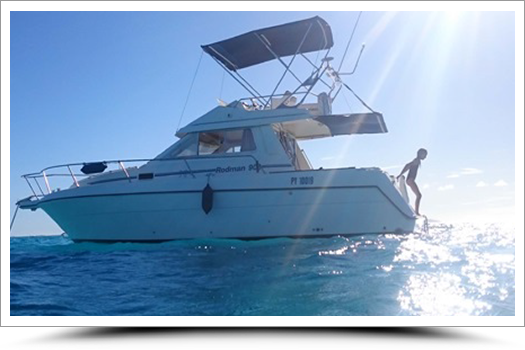 Embark on the catamaran Jet France, former boat racing of 23 meters long for a day cruise on the legendary Tetiaroa atoll. It features spacious deck with benches on the side and can accommodate up to 24 people. Fast sailing and comfortable during the cruise, you will be in 2 hours at the entrance of the former estate of American famous actor Marlon Brando. 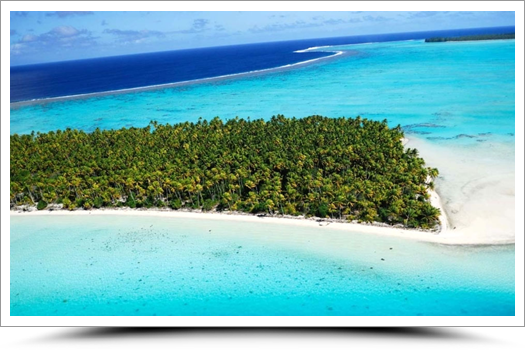 Only atoll in the Windward Islands, Tetiaroa, just 56 km from Tahiti, is a gem of 7 km in diameter surrounded by 13 islets covered with coconut trees, and crowned by a coral reef. Miniature paradise, it reveals a preserved nature, including nesting sites of sea turtles and nesting of several species of birds such as frigates, black terns, brown boobies red-footed, and other petrels on Tahuna Iti islet or ‘Bird Island’. 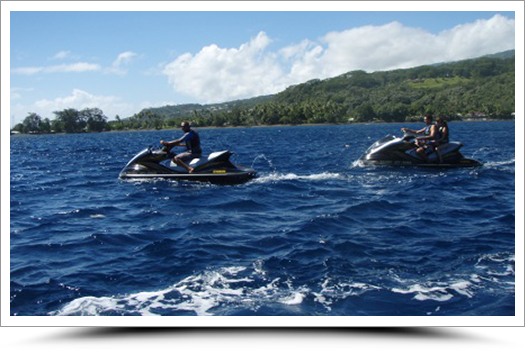 After a quick briefing from your guide, hop on your Jet Ski and follow the guide to explore the lagoon of Punaauia and Faa’a with its great view of Moorea. Depending on weather conditions and journey time, there are a range of routes you can take. For example, you may be able to go to the fisherman’s bay to see the dolphins, stop for a swim at the ‘aquarium’ where you can admire the tropical fish and coral gardens or you go right up to Papeete harbour. Ride your jet ski and follow the sun while it is still up in the sky. Cruise the lagoon and enjoy a stunning sunset behind the island of Moorea. It is surely worth the tour! If you really would like something special, inquire about the private Sunset VIP tour, where it is just you and your travel companion on a romantic tour watching the sunset and sipping champagne. A CD of pictures taken during the tour will also be available. A perfect excursion to start your trip to Tahiti off or to cap it off on your last day before flying back home. You will be picked up at your hotel and transferred to the West Coast Marina to set off on the beautiful and often overlooked Tahiti lagoon. Navigate towards the famous Taapuna Pass on board a comfortable boat to enjoy an encounter with the dolphins in their wild environment. 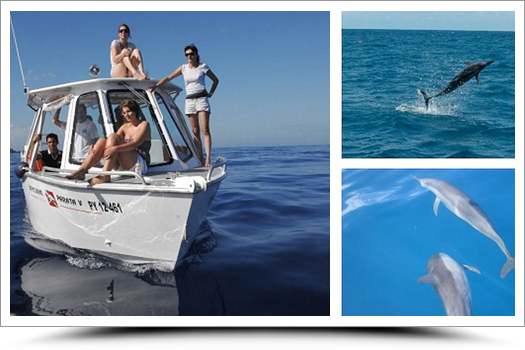 Your guide will teach you everything you need to know about these amazing creatures and provided the conditions are good, you get a chance to get into the water and swim with them in their natural environment. Back on board, enjoy a light snack and make your way back to the marina and transfer to your hotel. 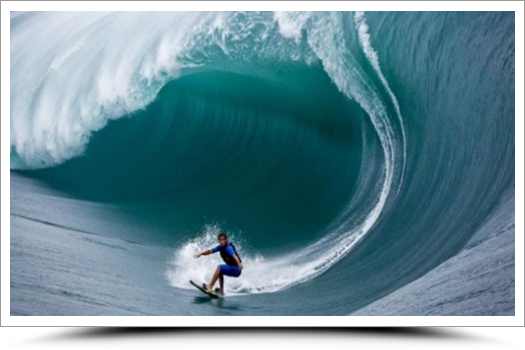 Surfing is one of Tahiti’s most popular sports and the famous Teahupoo wave is one of the surfing world’s most iconic challenges. But don’t worry, your instructor will choose much easier and safer waves on the East coast for you to practise on. You will spend 2 hours on site with an instructor and all the necessary equipment. Your professional instructor will come and pick you up at your hotel’s front desk in the morning. With a stack of boards on the roof of his mini van, you will be heading towards the most popular surf areas of the East Coast island. Before wetting your toes, a mini practical lecture will given on the shore to teach you the basic moves to have in the water. Following that, with your board and the help of your instructor you will be practising waves again and again, until you finally get to surf the famous Tahitian wave! Great fun expected !! Moderately difficult hike between the ocean and mountains in unspoilt Polynesia. 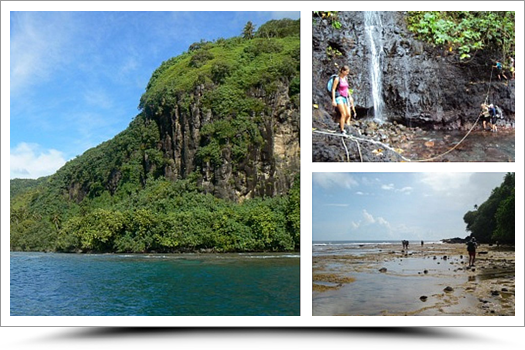 You will hike over lots of different terrain as your journey takes you to Tahiti’s wild and deserted coast: beach, undergrowth, coral reef flat etc. Take a break in a bivouac shelter in a cave by the sea. Breakfast, both lunchtime meals and dinner are included. (Return boat trip included). Explore the incredible Fautaua valley with its vast pools set in columnar basalt, archaeological sites and Loti waterfall (135 metres high). 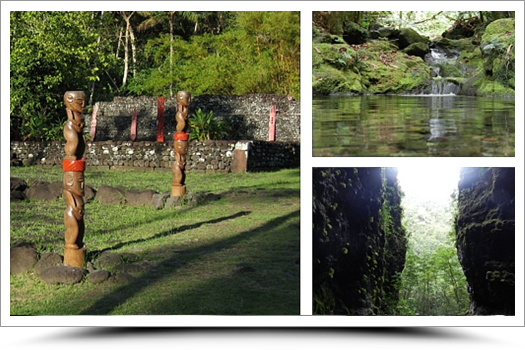 (Fautaua site entry fees included). Discover the Valley of Vaipohe, a half day hiking excursion that will enable you to discover the amazing tropical lushes sceneries of Tahiti. Escorted by your tour guide, Experience the interior of the island with waterfalls along the way and countless of flora species to observe. Here’s another awsome way to exerience the island of Tahiti! 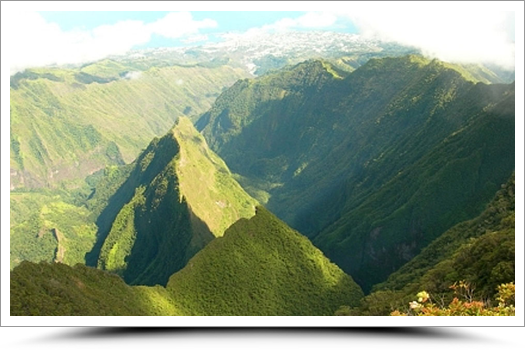 Go on this moderately difficult hiking trail for breathtaking views of Tahiti, the ocean and surrounding valleys. The Aorai is Tahiti’s third highest mountain and peaks at 2066 metres: you will hike up to the 1st mountain hut at an altitude of 1400 metres. You need to be fit and healthy for this invigorating hike. Moderately difficult “Canyoning” hike visiting lava channels that were formed during the volcanic period when the island was born. You will explore the rocks and vaults that Mother Nature herself has carved out. When you come out of the lava tubes, follow the river bubbling with waterfalls and have a swim in the cool water. Lunch and equipment included (headlight, gloves and coverall).